This is a brand NEW judo gi that I have for sale. It’s cheap and it’s good quality. It includes a jacket, belt, and pants. Works fine for jiujitsu too, yet it just has a bit longer jacket. I tried it on, but it was a bit big for me (5’11, 155) and they wouldn’t return it for free. Guess it would fit someone about 20-40 pounds heavier and/or a bit taller. I normally wear an A2 yet this was a bit big and may be closer to A3. It has a different sizing which is 4/170. 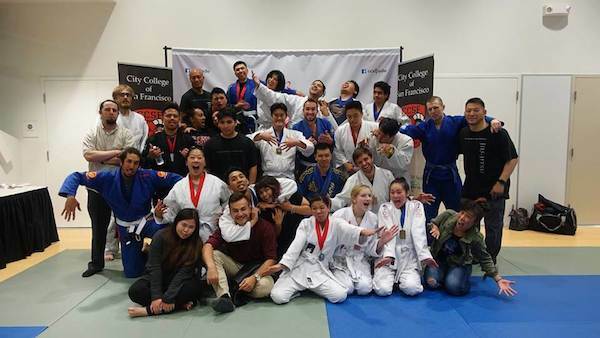 If you are a student a CCSF [or not], in San Francisco and are looking for a new gi for judo/jiu-jitsu then let me know and I can bring it in sometime. You can buy it on Ebay too for $59 +shipping or directly through me for $50 which is what I paid for it. This is the video version of a previous post. This is about how long it took me to get a blue belt in jiu-jitsu. 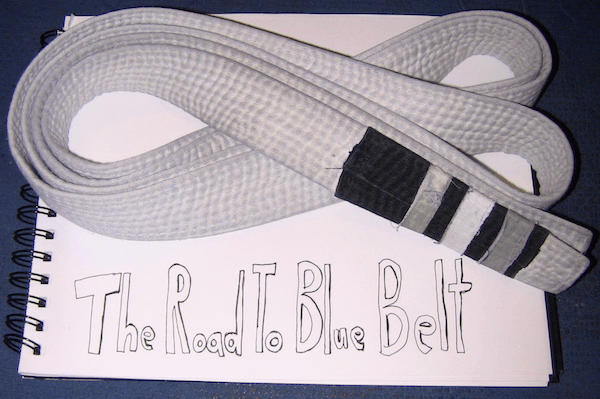 You can read the previous post here called the road to blue belt. Wondering how long it will take you to get a blue belt in jiu-jitsu? 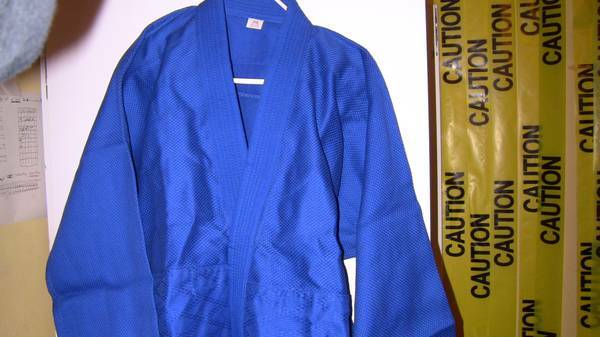 Funny I was thinking of writing this article “the road to blue belt” about a week or so ago and then I got one. I remember when I first started I had a goal where I wanted to get a white belt in a year. I wrote it on my wall. I was kinda destination driven. Then there was a bump in the road that knocked me out for 6 months or so. I hurt my knee. But I got back into it. As time progressed and when the year started to come to a close I started to think I wasn’t a blue belt and I scratched the goal out and replaced it with something like “have fun learning jiu-jitsu”. That became my goal. Sure I still wanted to get promoted, but it wasn’t the main thing. I thought I’d rather be a good white belt than a bad blue belt. I had learned that intrinsic rewards were better than extrinsic ones too. In other words you should do something because you enjoy it not because you want the carrot, paycheck, black belt or whatever. 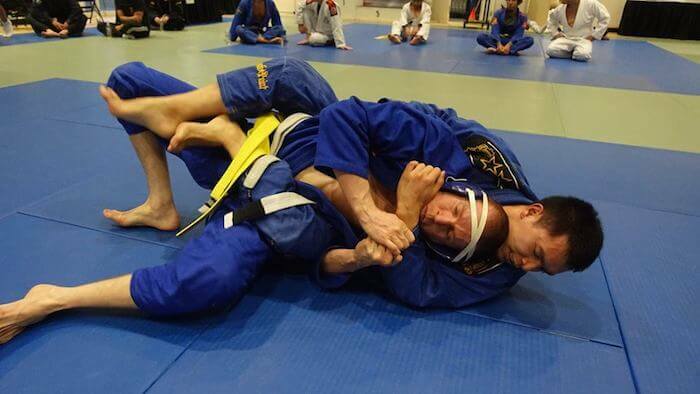 The road to blue belt in jiu-jitsu was a pretty long one for me. I looked back over my history and added up the time that I spent on the mat practicing jiu-jitsu. Normally I practiced 4 days a week. That translates to 16 days a month x 35 months = 560 days. There were times when I managed 5 and others when I did 3. Over the recent summer session at CCSF I did 2 days. But again normally I did 4 days a week. At Romulo Melo I normally did hour long classes. Occasionally I would do an hour and a half. I’d estimate 4.5 hours a week, 18 hours a month for 15 months = 270 hours. At Caeser Gracie I did a mix of classes that were 1-1.5 hours long. I’d estimate 4.5-5 hours a week. I’ll round down to 4.5, 18 hours a month for 2.5 months = 45 hours. At CCSF I probably spent more hours a week on the mat. I also took judo classes there a couple hours a week. Jiujitsu classes were 1-2 hours depending on the class. I’d estimate 6 hours a week doing jiu-jitsu, 24 hours a month for a total of about 17 months = 408 hours. I actually started at CCSF when I was still going to Romelo’s. I didn’t go there much my first semester so I didn’t include it above. So between the 3 schools that’s about 705 hours of jiu-jitsu. So that white belt above saw quite a few hours. In fact I replaced two of the stripes that fell off. The only original stripe on it is the really dark and dirty one. Those stripes were from training with Romelo Melo. They were from 2014-2015. For you – if you’re wondering I have no idea how long it will take. For me I think it took longer because I changed schools and had a few injuries. Had I stayed with Romelo (my first school) I think I would have gotten it a while ago. I couldn’t afford to keep going there and also I wanted to learn some judo. So I went to CCSF. I hurt both of my knees (bone bruises and a torn meniscus). They seemed to heal pretty good though. I had a rib that bothered me for a long time. A couple of armbars. Yes, I tapped, but not fast enough as in both cases the person didn’t let go immediately. Tap hard and tap early. Nothing ever popped, but the joints locked. The only thing that ever popped was my ankle in a toe hold. I didn’t see that coming and then the next thing I knew I heard and felt a pop. It bugged me for a while, but it’s o.k now. Funny some say white belts are sometimes the more dangerous ones. They are a bit more unpredictable and spastic as they haven’t learned much technique so they rely more on strength. As sensei says, “do the technique”. I have made a lot of friends through jiu-jitsu. Most of the people that I have met have been pretty cool. And despite the pain I have had a lot of fun. There’s been ups and downs when you don’t think you’re learning or your getting tapped out, but mostly it’s been fun. I think jiu-jitsu gives you energy too. There have been times when I went in there not feeling very good and then I’ll leave pumped up. Jiu-jitsu is scary. Competing is twice as scary. I still get a bit scared before every class. I would get scared of getting hurt. Sometimes it’s scary sparring with new people too. 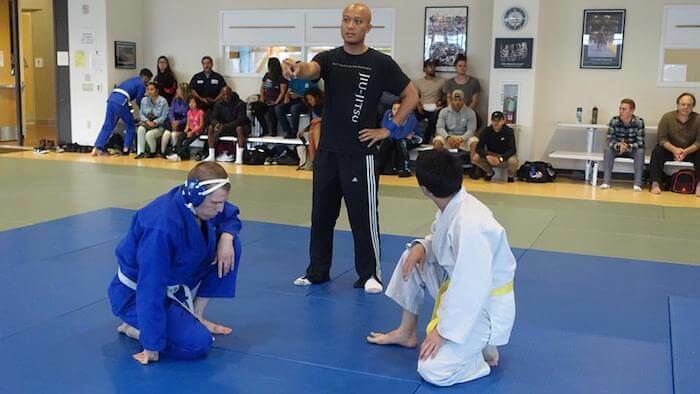 But I remember and say to myself something sensei Palacio said, “Do the technique”. I think I also just imagine dark sh*t happening sometimes too. Maybe I have a dark mind. It’s not just jiu-jitsu. Walking over the bridge to the competition the other night I just thought what if I fell of that bridge? And got hit by a car. But actually what’s really scary is not jiujitsu, but the anticipation of it. When you are doing it all the fear pretty much goes away. It’s a weird mix of excitement, fun and fear. How long will it take to get promoted? I guess it depends on a number of things, but based on my experience you’re more likely to get promoted if you stick with one school. Although I think moving around was actually good for me. I got instruction from different teachers, but as far as getting promoted goes it probably didn’t help. Different schools have different ways of promoting. Guess it’s up to the teacher. Romelo Melo only did promotions like twice a year or so. During those times he would promote a bunch of people at the same time. Caeser Gracie seemed to have no formal promotion. I saw Alessandro promote someone at the end of class once. CCSF doesn’t seem to typically do jiu-jitsu promotions. Since I have been there since 2015 I know of 4 people total who got promoted to blue belt. CCSF is more focused on judo. They do promotions once or twice a semester for judo. Sensei, myself and Samir. 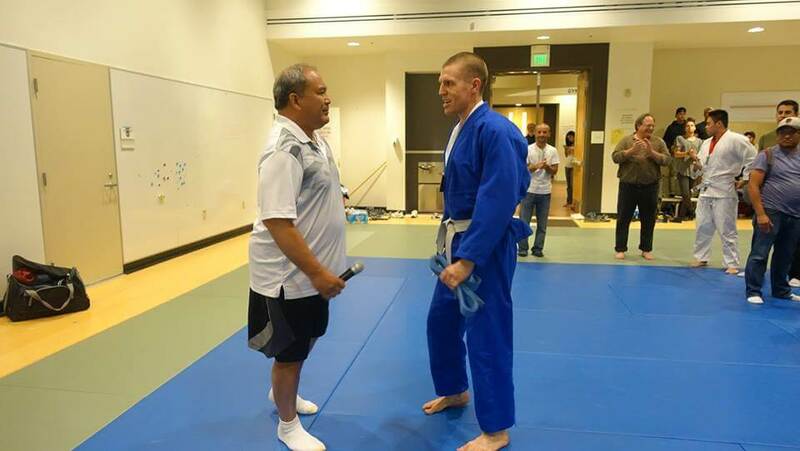 Both are judo and jiu-jitsu teachers at CCSF. 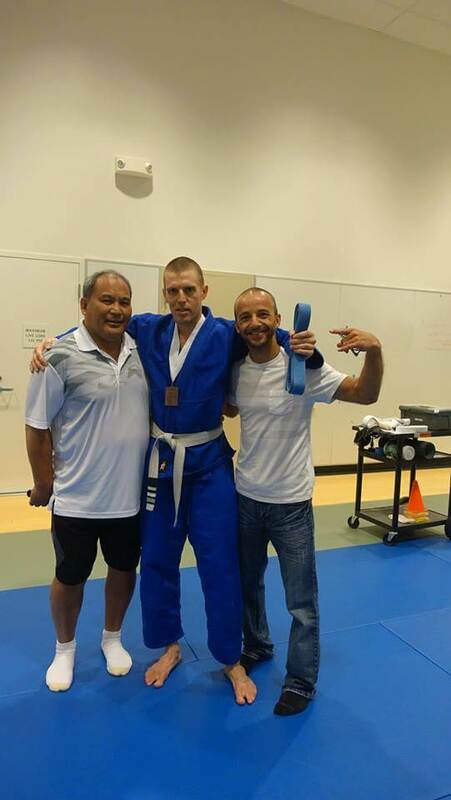 I actually got my blue belt after the recent competition on Friday July 21, 2017. That was unexpected. Funny I got a little choked up too. I don’t know it just kinda seemed like an abstract thing. Most of the time I just figured I’d get it eventually and just tried to focus on doing it and having fun. I know other people who trained at CCSF who were white belts for a long time. Some even longer than me, like 4 or 5 years+. At one time I wondered how long it would take. It might take longer than expected or it could come sooner. So I’d just say enjoy the ride. If you are doing jiu-jitsu or judo then chances are at some point you will get sore fingers from all the grabbing of the gi. In this video I’ll show you 2 ways how I deal with finger pain and soreness. I used to dunk my hands in cold water and that helped for the pain. Yet I didn’t think it did much for helping them heal. I also used to tape my fingers a lot. But I am not sure that it did much. Then I started soaking my fingers in warm water and that helped. Your fingers like your toes are on the end of your body so they get less blood flow than other parts of your body. So I think the warm water will improve blood flow to them and help them heal as they sometimes get micro injuries from the grabbing. You can try it out whenever your fingers are sore. You can soak them in warm water for 15-20 minutes a time. I also combine this with meditation. So I am doing 2 beneficial things at once. The other thing I do is use DMSO. You can apply this to your fingers after you have showered or at least washed them. I notice less stiffness and soreness after doing this. In this video I cover the different kinds of wear and tear most people get from jiu-jitsu (bjj) and judo. The topics I cover are fingers, bruises, scrapes and cauliflower ear. Your fingers will get beat up a bit from grabbing the gi. They will get a little raw around the knuckles at first. Over time you will develop calluses on your top knuckles. I think everyone will get this unless you do no gi. Some people don’t bruise, but I do. I tend to get bruises on my legs and arms. Toe injuries are common too and one thing you’ll probably get are scrapes on your feet from the mat. Cauliflower ear is also common amongst grapplers. I noticed recently that I have a little in my right ear and I wear a head piece most of the time. It’s kinda scary. You feel those nerves starting to twitch days before the competition whenever you start to think about it. Come the day you start to think why am I doing this? I don’t have to do this. But you do it. And it’s pretty intense cause the other guy is probably just as scared and is trying to throw you, choke you or get you in a shoulder or arm lock. Here’s a video of some of the highlights from the competition. I got 3 submissions (armbars from mount). If you get the guy to tap out by arm/shoulder lock or a choke then you win. You can also win by points, but they are secondary to a submission. Certain positions are considered more dominate and you can get points from those like mount, back, side control. Then you can get points from sweeps (going from bottom to top) and guard passes (getting out from between the guys legs). I just focus on trying to get the submission as I think that is more martial art like versus a sport. I won 3 and I lost one by points. The guy I lost to had a wrestling background. He was pretty athletic. He won because he got 4 points for a mount position, but I got out. I had only 2 points from a hip sweep. My friends said I was only a second away from winning. I just got my leg out but just a hair of a second too slow as the buzzer went off. I guess losing is not really a loss. For one he didn’t submit me. So losing by points is not like losing from tapping out and avoiding a broken arm. It’s a game. It’s still not quite as tasty as a win, but there’s something to learn from it. I saw my technique for guard passing towards the end to be pretty sloppy and there were a few things I would do differently. It’s more intense than practice. You get tired really quickly if you are going 100%. It’s cool to watch the matches over and over again. You can see what you did wrong and what you can do better next time. 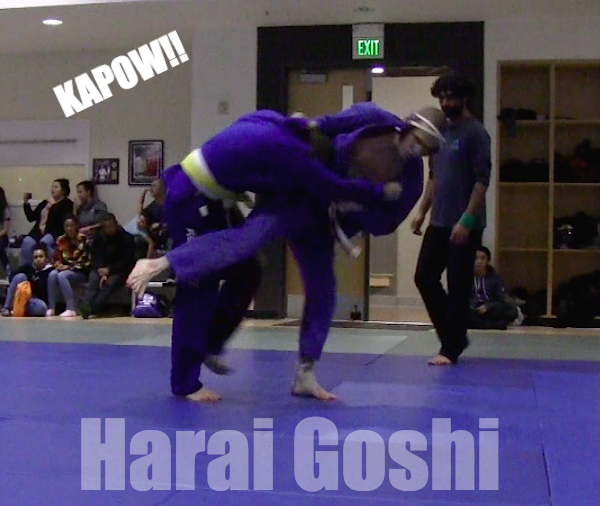 I did do one judo throw called harai goshi and followed it with an armbar. You can see it in the video above at 1:36. That’s why I did it. That’s what my teacher said was incentive to do it. It’s a lot more intense than class. It’s more like a real fight with a few rules. I got nervous, but being around your friends makes it fun too. And then after our teacher took a bunch of us out to Chinese. It was a great time. I have been practicing Jiujitsu for about 20 months or so total on the mat. I have been going about 4 times a week or so and have been going to CCSF for about 2 semesters. I love it. 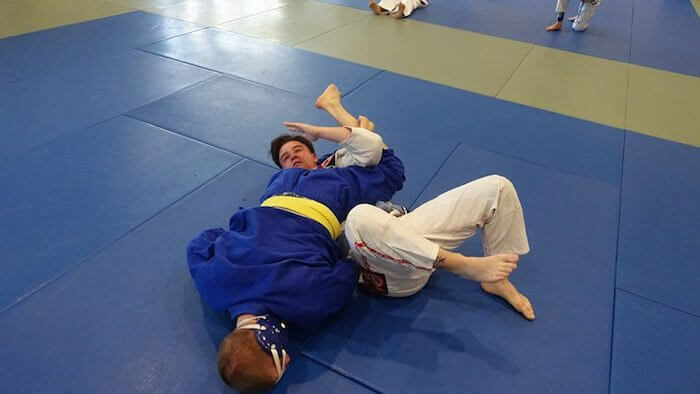 Jiujitsu is really fun and it’s easy to get totally absorbed with it and just in the moment. They also have some Judo classes there which I have been also taking, but I don’t feel very comfortable standing up yet compared to on the ground. There’s still a lot to learn in both places. This video is a little long and unedited. I have an edited version of my 2nd competition at CCSF. They have jiujitsu and judo tournaments there every semester. I was going to do the one last semester, but I got hurt. I had a friend at my first school Romelo Melo who said I should do it least once. I remember I got nervous just watching the one last semester. I was a little nervous come this tournament, but not as nervous as I thought I would be. For my first tournament I thought I did alright. I won 2 and lost one by points to a take down in “overtime”. Losing by points is not as disappointing as losing by submission. I think a submission only contest would be more interesting. I wasn’t so sure if I would compete or not, but the thing that made me do it was something my teacher said. I asked him “Why compete?” He basically said to face your fears. He went on to explain it more, but that was enough for me. I decided that I would record it so that I could watch it. It’s pretty cool as you can see some things that you could have done differently. You get a different vantage point. In my first match I wasn’t warmed up. That’s the thing in class you always do some warm-up exercises and drilling before you start to spar (roll). But I guess in tournaments you don’t have that option. It was pretty sudden and the guy seemed pretty aggressive. I guess I wasn’t very ready as it was my first. He didn’t get close to submitting me once. I did have a couple of triangle choke attempts and cross collar choke, but I didn’t get him. He won by a single leg take down in overtime. There’s a counter to that which I will do next time. That is with the Judo throw uchi mata. So that’s one thing I learned. So like they say if you lose you learn something. My second match I did pretty good and won by points. 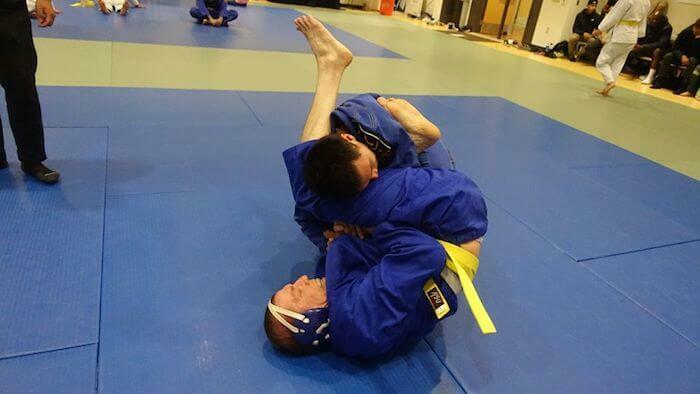 I was adjusting for a triangle armbar when the time ran out. I swept the guy I think a few times and almost got a few submissions. In my third match I won by triangle choke. It was a good one too. I had my legs in the right positions and I got it from mount and then rolled over to my back. My triangles have been getting better.